A better home built to last. Perfect for every owner. Second on Right: Estimator and office manager for Braemyn. Brent has worked in the construction industry for over 30 years starting with framing and transitioning to building in the early 2000’s. He has worked on everything from single family homes to side by side infills and numerous multi family complexes. 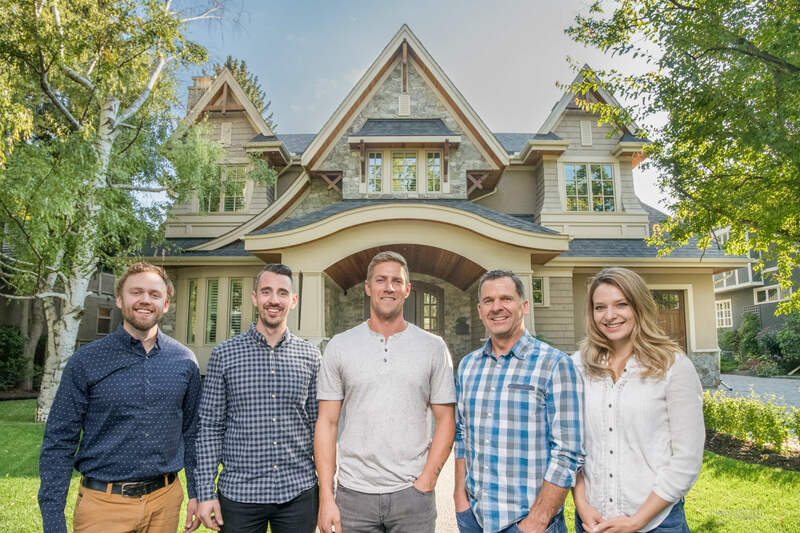 Brent’s passion for custom homes comes from his love for creating something new, and embracing the challenge of unrepeated elements in each project. His high attention for detail and perfection is a significant factor in producing quality homes. Brent also focuses on trade and customer satisfaction as he recognizes the importance of great relationships in the building process. He is a key component in project preparation prior to construction, and is a visionary for Braemyn’s success and growth. Far left: Site supervisor for Braemyn. He has a background running and leading crews in heavy equipment as well as carpentry for a multi unit condo complex. His background laid a foundation for construction experience and team leadership development. He has a Bachelors Degree in arts, and various certifications on worksite safety. Sean is recognized by clients for his willingness to serve and his great attitude. His investment in those relationships results in a great appreciation for the care that he diligently puts into his work on each project. Second on Left: Site Supervisor for Braemyn. He has spent 10 years in the construction industry with 6 of those specializing in Luxury home building and Renovations. He has spent the last 4 years growing in project management and has a passion for finishing and detail that reflects in his work. Whether it’s the beginning of a project or before the client moves in, he values the investment in relationships with the trades and clients. He approaches every project with a positive attitude and the knowledge that there must be trust throughout the build to achieve excellence. Far Right: Specializes in design and purchasing for Braemyn. Her passion for customer based work originated with a management position at Starbucks. Training employees and aiming to please clients on a daily basis cultivated an understanding for the value of exceeding expectations and putting people first in a business. She has an eye for detail and offers insight and assistance with the clients’ selection process and company product ordering, ensuring that products are purchased and organized in line with the build.